All the members of the family Pomacentridae, expect for those belonging to the genera Amphiprion and Premnas, are referred to as Damselfish or Damsels. (The members of Amphiprion and Premnas are known as Clownfish / Anemone fish.) Most Damsels have a deep and compressed body with a small mouth. The largest species can reach a length of 35 cm (almost 1 foot 2 inches). Damsels are popular in saltwater aquariums and many species are comparatively robust and hardy. Such species are a good choice for novice marine aquarists and are also commonly chosen by advanced marine aquarists to cycle newly set up aquariums. Even a small 100 L aquarium is large enough to keep certain damsel species, provided of course that you know how to keep the water quality up and the environment stable in a small aquarium. Damsel eggs are place on the bottom and guarded by the male fish. 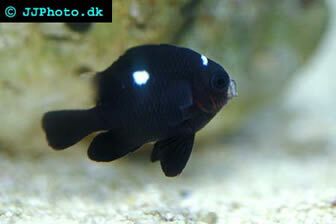 Several species of damselfish have been successfully bred in aquariums. Since certain Damsel species are much trickier to keep in captivity than others, it is important to research the particular species you are interested in before you make a purchase. Since Damsels are a common choice for beginners and newly set up aquariums, some aquarists view them as “junk fish”. This is however very far from the truth; you can find a lot of beautiful, colourful and interesting members in the Damsel group, and many experienced aquarists with large aquariums do keep damsels. All Damselfishes are marine creatures, but a few species can be encountered in the lower stretches of freshwater rivers. Damsels are present in all tropical seas, but they can also be found in certain temperate regions, such as the northern pacific coast of Mexico and the southern coast of California. A majority of the damsels are however native to the Indian Ocean and the tropical parts of western Pacific Ocean. Damsels are not fuzzy eaters in captivity and they will normally accept a long row of different food. It is important to remember that some species are herbivore, some feed chiefly on plankton, and some are omnivore. Research your particular species to find out its feeding requirements. Providing your damsels with a varied and well balanced diet will prevent the risk of poor health in the aquarium. Damsels are recommended for beginner marine aquarists, but it is important to keep min mind that damsels can be quite aggressive. Damsels are known to be territorial, especially if you keep older specimens, and they can attack other damsels as well as other fish in the aquarium. Some species will become extremely territorial as they grow older, while others are more docile. If you want a fairly non-aggressive damsel you can for instance get a group of Chromis viridis. Always keep at least five specimens of this species together, preferably more. They may pick a little at the lowest ranking member of the group, but it will rarely result in injury. In the wild, Chromis viridis forms huge schools along coral reefs.